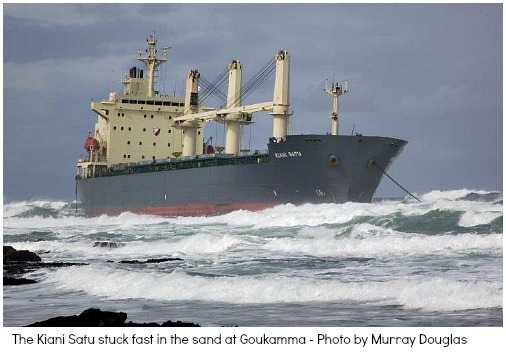 On 8 August 2013 locals woke up to hear that a large ship, the Kiani Satu stricken with mechanical engine failure was being helplessly swept towards the beach by gale force winds and high seas. 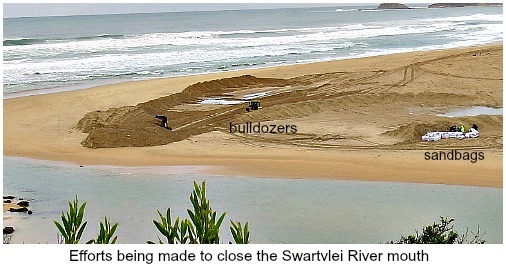 Within hours the hapless vessel was stuck fast in the sand and breakers not far from the Goukamma river-mouth in the Marine Protected Area. The 165m bulk carrier registered in Antigua and Barbuda had 19 Filipino and Ukranian crew members on board, 15000 tons of rice in its hold and 330 tons of fuel in its tanks. The cargo from Vietnam worth US$6.9 million (R73 million) had been on its way to Ghana on the West Coast of North Africa. It still had over 3000 nautical miles to travel. Speedily emergency services responded and whilst Wilderness and Knysna NSRI rushed to get their rescue teams and equipment to Buffalo Bay, the local Titan helicopter with its crew lifted off heading for the seamen trapped on their battered ship. 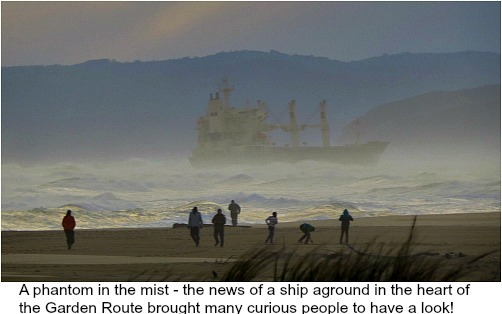 Within sight of land the ship was being pounded in the surf zone with massive waves and it was impossible for the rescue boats to approach anywhere close to the vessel. 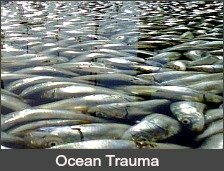 So while the sea rescuers stood by to assist if it became necessary, the Titan flew in to begin the tricky pick-up of the casualties. 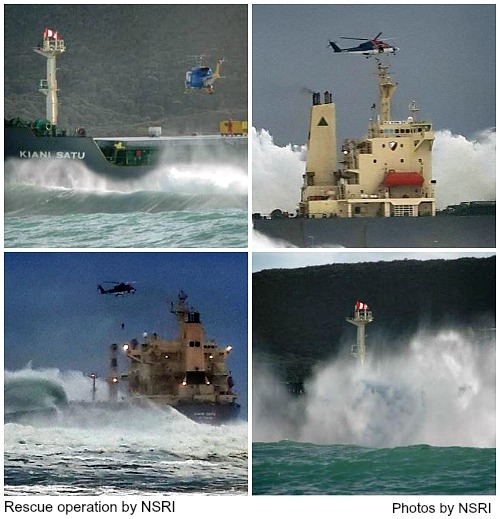 Torsten Henschel and Donald Oliver of NSRI were on board the helicopter. Donald was carefully lowered onto the only possible landing spot, a 3 square meter piece of deck next to the bridge. Then, with directions and encouragement from Donald on the ship, the anxious sailors were hoisted one by one from the Kiani Satu and in batches of 3 or 4 flown to land. It was treacherous for the seamen on the slippery deck. 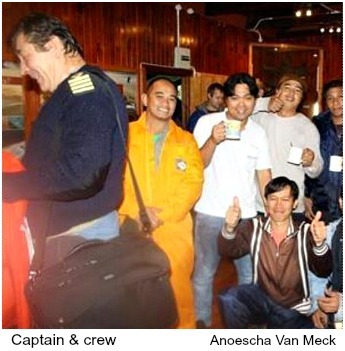 It was a dangerous task for the flight engineer and helicopter pilot working together to co-ordinate the winching and the flying as violent spray continually slammed against the ship and shot high into the air but in the end both rescuers and rescued succeeded in returning to dry land safely. What a great "mission accomplished” story! 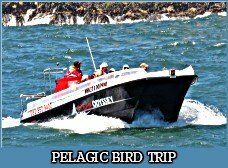 The entire crew were taken to a Mossel Bay hotel to await the processing of official documentation. 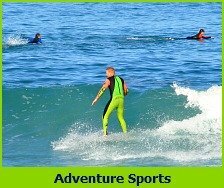 Behind the scenes away from the drama taking place at Goukamma beach another series of events unfolded. 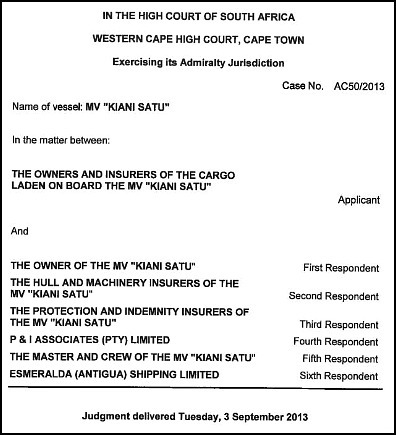 Senior crew members were not allowed to leave South Africa as the owners and insurers of the lost cargo approached the High Court of South Africa in Cape Town to request that a Commission of Enquiry be established to determine what had occurred on board the ship that led to its stranding at Goukamma. Over the days that followed, Judge Willem Louw of the High Court heard from the applicants and respondents passing his judgement on 3 September. He granted an order for a Commission of Enquiry to take place and appointed a commissioner. In Cape Town, Commissioner David Melunsky heard evidence in terms of the Admiralty Jurisdiction Regulation Act. 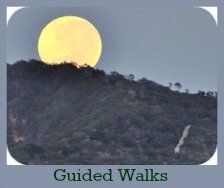 This was anticipated to last between 5 to seven days. The media were not allowed to attend the proceedings. In Germany, the owner of the ship was to file for insolvency. 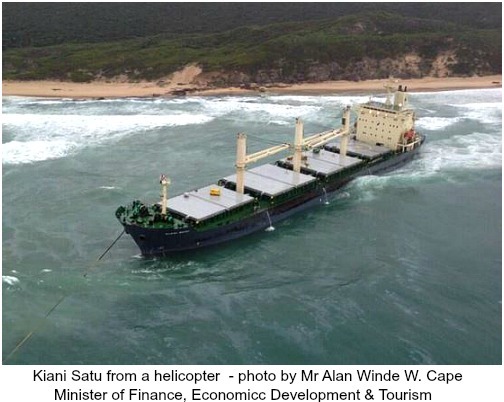 Meanwhile, in the Goukamma Marine Protected Area, the SA Marine Safety Authorities attempted to use the old warrior tug, Smit Amandla (formerly the John Ross) to tow the ship out to deeper water but it was stuck fast in the sand. 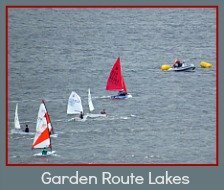 Plans were implemented to lighten the vessel by transferring the oil to plastic tanks to remove it to land. 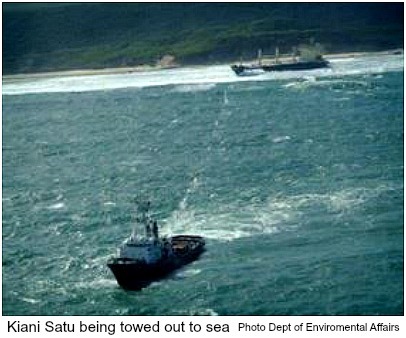 At some stage it was decided to remove some of the spoiled rice, again to lighten the load and allow the Kiani Satu to be towed out to deeper water. As bad weather continued to hamper these plans, the damaged hull of the ship started to leak oil into the environment. 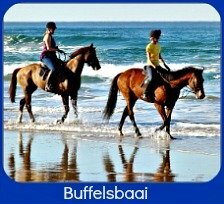 A Joint Operations Centre was established in an area between Buffalo Bay and Goukamma Nature Reserve in anticipation of such an event. A large contingency of stake-holders ranging from national and provincial government, local and district municipalities, conservation partners, NGO’s, business and private individuals met to co-ordinate efforts to ameliorate the crisis. The ship’s owners were present and assured everyone that they were adequately insured and all costs involved in clean-ups and the salvage operation would be covered. This news was a great relief to everyone. 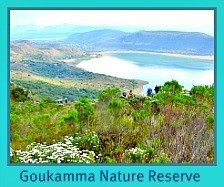 Besides the immediate pristine environment, three estuaries, the Goukamma, Swartvlei and Knysna were in danger of pollution and all the marine life that lived in or moved through the area. 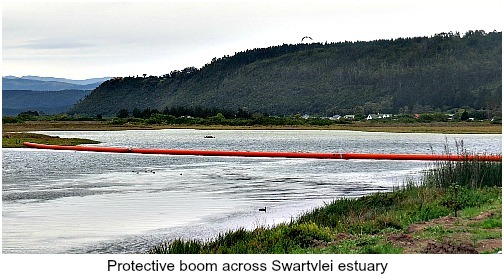 As efforts were made to close the Goukamma and Swartvlei estuaries, collecting booms were put in place at Goukamma, Knysna and Sedgefield. 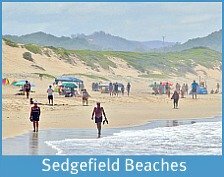 At Goukamma and Sedgefield rough seas, strong out-flowing water and high tidal flow thwarted attempts at first to close the river mouths. Fortunately the rough seas also dispersed the oil quickly. 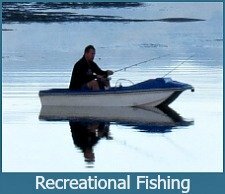 However, the Goukamma area, beach, rocks and river suffered some oil pollution. 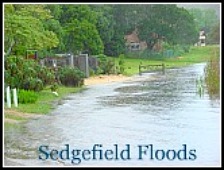 Ultimately Knysna and Sedgefield were not affected. 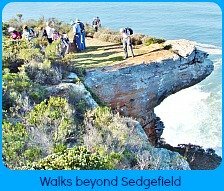 Lakes Bird Club members patrolled the beaches from Gerickes Point to the Swartvlei River mouth on almost a daily basis and the local Sedgefield Walkie Talkies walked from Myoli to beyond Platbank to check for oil-spills and/or oiled sea-life. Closer to the beached vessel a demarcated area was cordoned off so that professional beach cleaners could do their work unhampered and salvage operations from the ship could take place without curious spectators getting in the way. 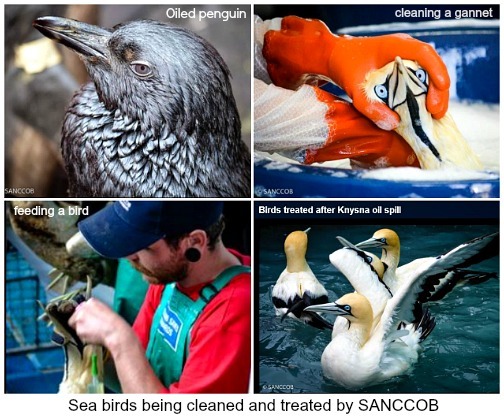 As concerned people along the coastline started finding oiled birds they were taken to various designations where SANCCOB personnel were able to care for the casualties hydrating, cleaning, feeding and rehabilitating them. 49 oiled penguins, 98 gannets and 7 cormorants were rescued and sent for rehabilitation. Mortalities were some 14 cormorants and 2 seals. Dr Mandy Lombard said that whales seemed to know to avoid the danger. At JOC, locals made efforts to provide beverages and sustenance for those working tirelessly on the beaches in cold and inclement weather. 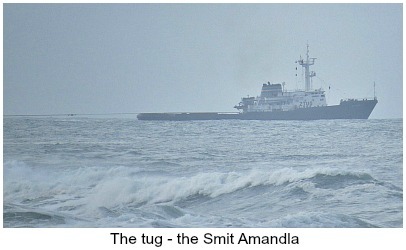 Nine days later on 17 August as the stormy sea began to calm, the Kiani Satu was pulled off the beach and towed out to sea by the tug Smit Amandla that had been standing by for days in sight of land waiting for the right weather conditions to present an opportunity to refloat the vessel. 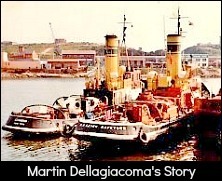 Salvage teams continued to drain her tanks of their fuel until it became too dangerous to do so as the ship continued to take in water through her damaged hull. In the early hours of 21 August the Kiani Satu sank beneath the waves to her watery grave 110 nautical miles off shore to rest on the sea floor at a depth of 1000 metres. In all, over 350 people were involved in the various programs that dealt with the whole Kiani Satu calamity. 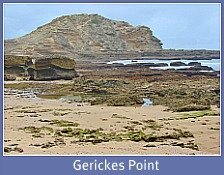 The clean-up operation was on-going for some weeks as oil continued to be exposed by wave action on beaches in the Goukamma MPA. Roleplayers to be acknowledged and congratulated for their successful efforts in mitigating the disaster of the Kiani Satu incident. 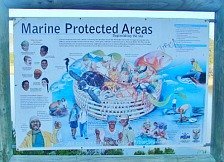 SANCCOB (The Southern African Foundation for the Conservation of Coastal Birds) is a leading marine-orientated non-profit organization which has treated more than 90 000 oiled, ill, injured or abandoned African penguins and other threatened seabirds since being established in 1968. 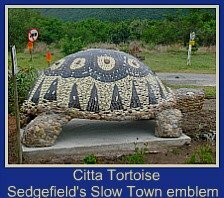 Independent research confirms that the wild African population is 19% higher directly due to SANCCOB’s efforts. 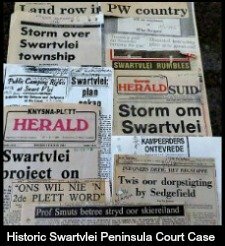 The NSRI came about after 17 fishermen drowned in a storm at Still Bay in 1966. 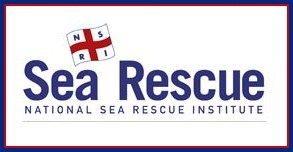 The letter-writing of a determined Miss Pattie Price led to the establishment of the National Sea Rescue Institute in 1967. 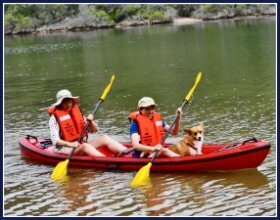 Its first rescue craft – a 4.7m inflatable boat called Snoopy donated by the Society of Master Mariners. Today the National Sea Rescue Institute (NSRI) is run by 940 highly skilled, unpaid volunteers who are on standby day and night throughout the year.